The music and poetry of Georgia native Sidney Lanier will be featured in “The Land, the People and Providence,” a special concert on Sunday, March 19, at 7 p.m. in the sanctuary of Glenn Memorial United Methodist Church. The music and poetry of Georgia native Sidney Lanier will be featured in “The Land, the People and Providence,” a concert on Sunday, March 19, at 7 p.m. in the sanctuary of Glenn Memorial United Methodist Church. Glenn’s Chancel Choir, conducted by Steven Darsey, will perform along with instrumental soloists from the Atlanta Symphony Orchestra. Brent Runnells will accompany the choir on piano. The one-hour concert is free and open to the public; an offering will be taken. However, Lanier was also a virtuoso flute player, composer, author, scholar and lecturer on literature and poetry. In 1945, he was elected to the Hall of Fame for Great Americans. Featured in the concert will be Lanier’s poem “Life and Song,” set to music by Darsey in memory of Robert Shaw, the longtime music director of the Atlanta Symphony Orchestra (ASO) and founder and conductor of the ASO Chamber Chorus. Marci Gurnow of the ASO will be clarinet soloist with this work. “Lanier’s ‘Life and Song,’ though written from a poet’s vantage, comprises a profound tribute to Robert Shaw,” says Darsey. “The final couplet: ‘His song was only living aloud, His work, a singing with his hand!’ vividly describes Shaw as conductor. As Lanier’s poem is strong in form and craft, and rich in imagery and meaning, I strove to embody these in the musical setting as tributes to Shaw,” he continues. Christina Smith, Jill Hertz Principal Flute with the ASO, will perform “Wind Song,” a work for flute composed by Lanier. Also included will be two art song settings of poems by A. L. Tennyson, “Flow, Down Cold Rivulet” and “Break, Break, Break,” composed by Lanier. These two works were found by Darsey as manuscript copies in the Lanier archives of Johns Hopkins University. The concert will conclude with Lanier’s “Meditations of Columbia,” a cantata commissioned for the centennial of the United States, set to music by American composer Dudley Buck. These texts and musical works address individual and national morality under the providence of God. Vocal soloists will be Alexis Lundy, Cynthia Shepherd, Magdalena Wór, Timothy Miller and Lawson Anderson, three-time district first place winner and region finalist in the Metropolitan Opera National Council Auditions. The Glenn Chancel Choir is composed of volunteers and professionals. 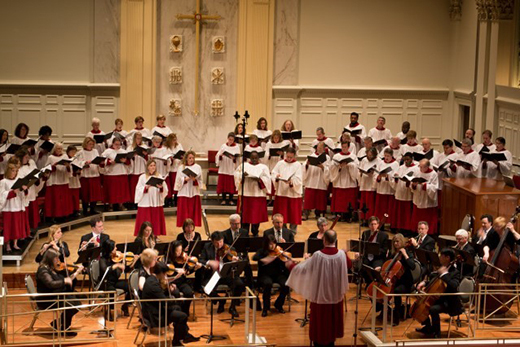 In 2006, the choir participated in the concert recognizing the 100th anniversary of the Atlanta Race Riots. On tours, the choir has sung at the Rockefeller Chapel of the University of Chicago and at Riverside Church in New York City. For more information, contact Nancy Buckhannan, 404-272-2051.